It’s pumpkin season and what better way to celebrate my very favorite time of the year than by sharing this recipe for Three Ingredient Pumpkin Muffins! Ever since I was a child, fall time has always been my favorite time of the year, due in part to the delicious baked goods in abundance, (especially pumpkin bread and pumpkin muffins) during the autumn season. I grew up attending a small, community church and each year, usually just as the weather started to cool somewhat, a sweet little lady in the church would start to bake Pumpkin Bread and Pumpkin Muffins and would sell them to buy Christmas gifts for her grandchildren later in the year. We always bought pumpkin bread and pumpkin muffins from her because she always had the very best! One quirky thing about her pumpkin bread was that no matter how many loaves you purchased, you could always count on finding ONE piece of an eggshell in each loaf. It was only one little eggshell piece and you never knew who would end up with the slice of pumpkin bread containing the eggshell, but you could bet money that there WOULD be an eggshell in the pumpkin bread. We used to try to predict who would end up with the slice of pumpkin bread containing the eggshell. haha! 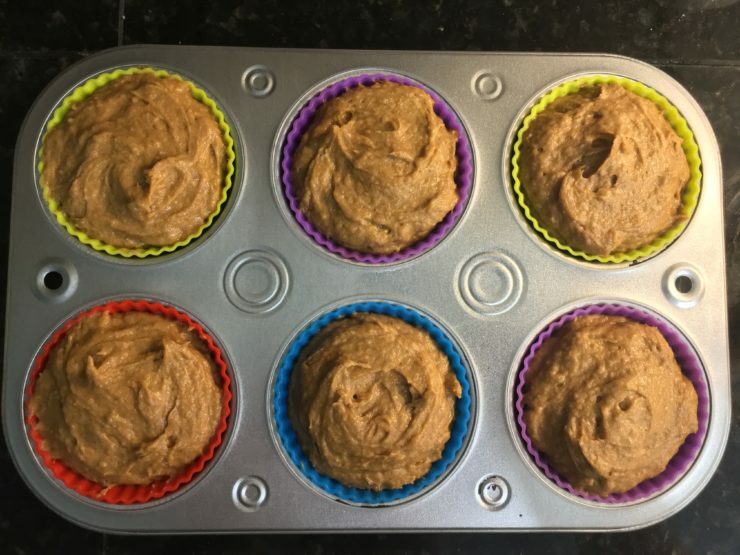 These Three Ingredient Pumpkin Muffins are every bit as delicious as her famous Pumpkin Bread was, but I can guarantee that you won’t find any eggshells in these Pumpkin Muffins, why am I so confident? Well, because these Three Ingredient Pumpkin Muffins only have THREE ingredients, and they are completely egg-free! Yep, you heard me right! These Egg and Dairy Free Pumpkin Muffins are fluffy, delicious, soft, moist, and so simple and easy to make! 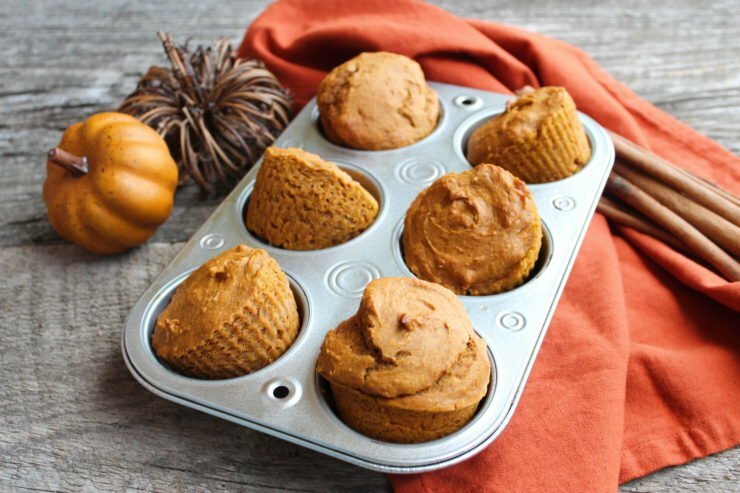 The smell of pumpkin spice muffins always takes me back to my visits to the Pumpkin Patch each fall with my school group. We always went to the Pumpkin Patch for a field trip and it was the highlight of my year, going through the corn maze, climbing over the tops of the hay bales, and picking my very own pumpkin. Now that I have a child of my own, I have made it a tradition for our family to visit our local Pumpkin Patch every year and I can already tell my son is loving it as much as I did as a child. It’s so fun to start new traditions with him and re-live some favorite childhood memories! 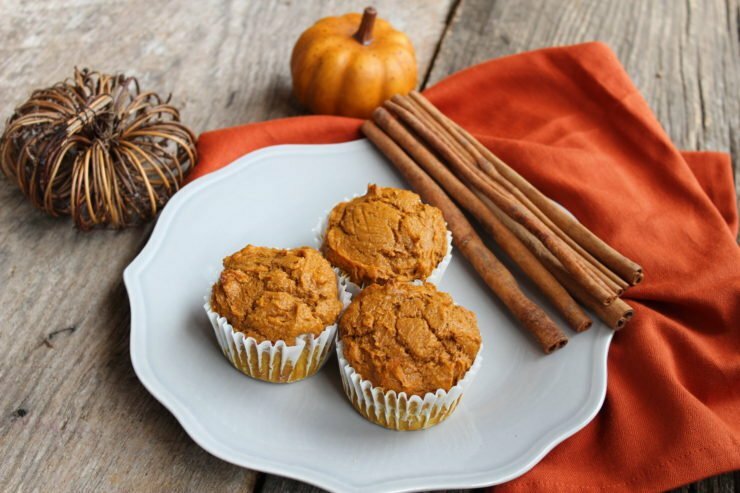 With autumn just around the corner and the stores already decorating for Halloween and Thanksgiving, I felt like it was the perfect time to share my Easy Pumpkin Muffin recipe with you so that you can whip up a batch of these and have your house smelling like Fall time. 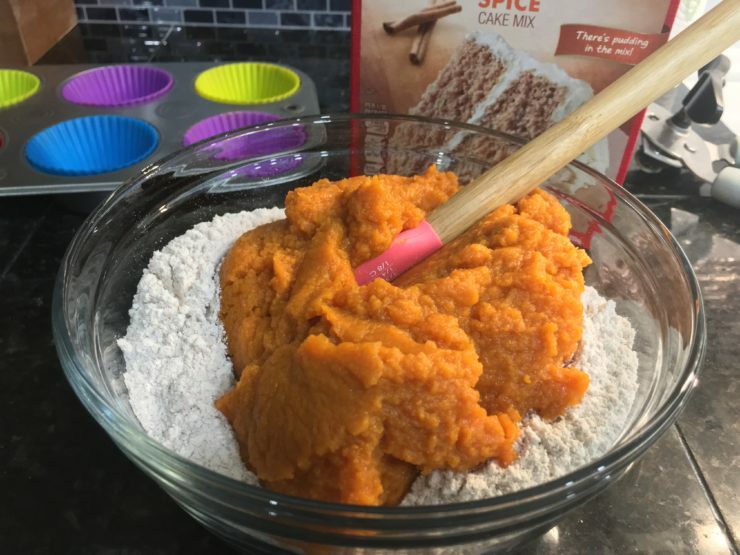 Start out with one, 15 ounce can of 100% pure pumpkin puree (no seasonings, just the pure pumpkin), 1/4 cup of unsweetened applesauce, and 1 box of Spice Cake Mix. 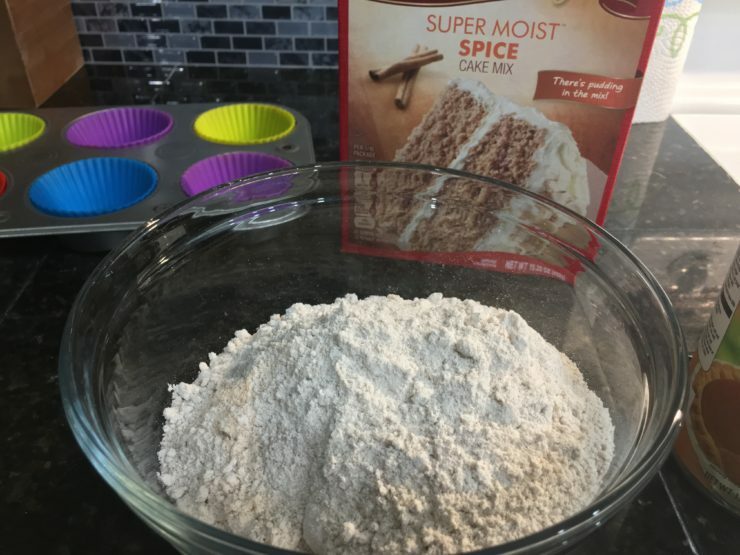 I prefer to use Betty Crocker or Pillsbury boxed cake mixes because I find that they are the most moist and flavorful (and also the closest tasting to homemade I have found) but you can use any brand of boxed spice cake mix you prefer. Lastly, grab a muffin pan and line it with silicone muffin liners. If you are using a half dozen muffin pan like I did, you will need to make two batches since this pumpkin spice muffin recipe yields 12 pumpkin muffins. 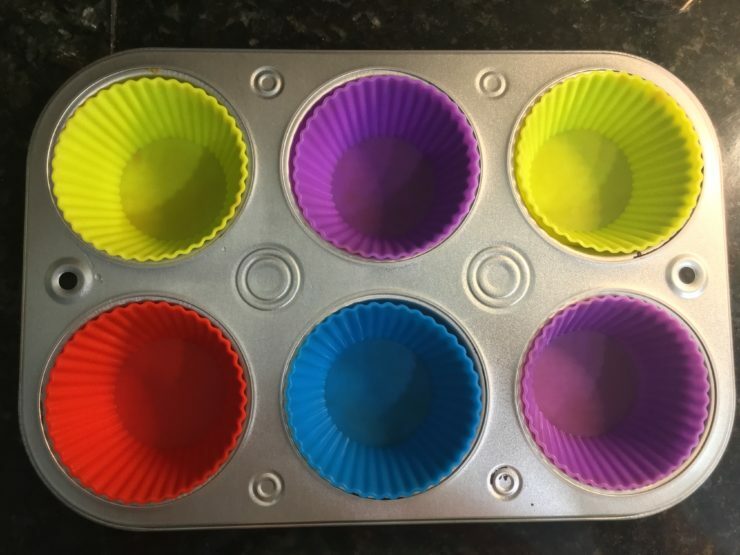 Let me give you a pro tip when it comes to making these pumpkin muffins; first, you can find this exact muffin pan I’m using below, at Walmart for only $o.88 (yes, I typed that correctly!) and it bakes so well and evenly! I will definitely be buying more because it bakes better than some of my more expensive muffin pans! My second Pumpkin Muffin baking tip is to use silicone liners (these muffins tend to stick in paper liners so I don’t recommend them at all) and spray your silicone liners with nonstick cooking spray before adding your batter, otherwise the batter will stick. 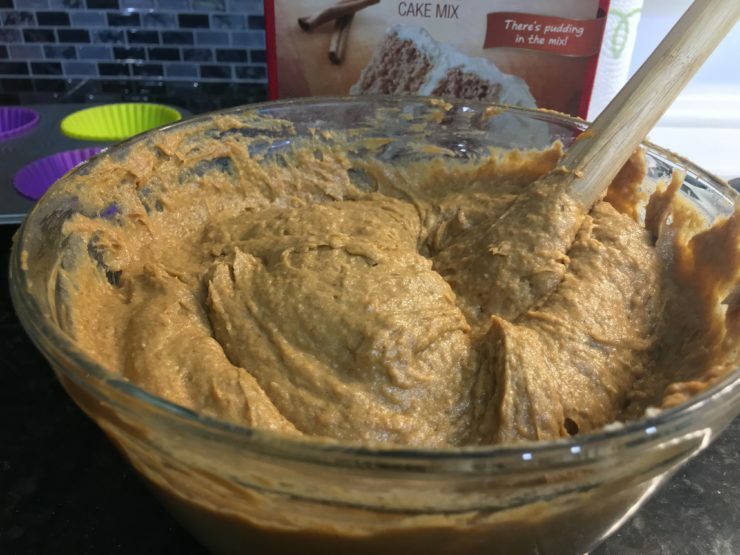 Now that we have the muffin pan lined with silicone muffin liners and the liners sprayed with nonstick cooking spray, empty your entire box of Spice Cake mix into a medium/large sized mixing bowl. When my mom baked growing up, emptying the cake mix into the bowl was always my job and I took it very seriously, although I would usually still end up coated in powdery cake mix. To this day, no matter how careful I am, I always end up with a light dusting of cake mix all over me! After you’ve emptied the Spice Cake mix into your mixing bowl, add in the 15 ounce can of 100% Pure Pumpkin Puree. Be sure you are using pure pumpkin puree (the ingredients should just be pureed pumpkin) and not Pumpkin Pie filling since the Pumpkin Pie filling will have spices and seasonings in it. Your Spice Cake mix will provide all of the spices and seasonings you will need for this recipe. Stir the pureed pumpkin and the Spice Cake mix until both ingredients are well combined and completely smooth. 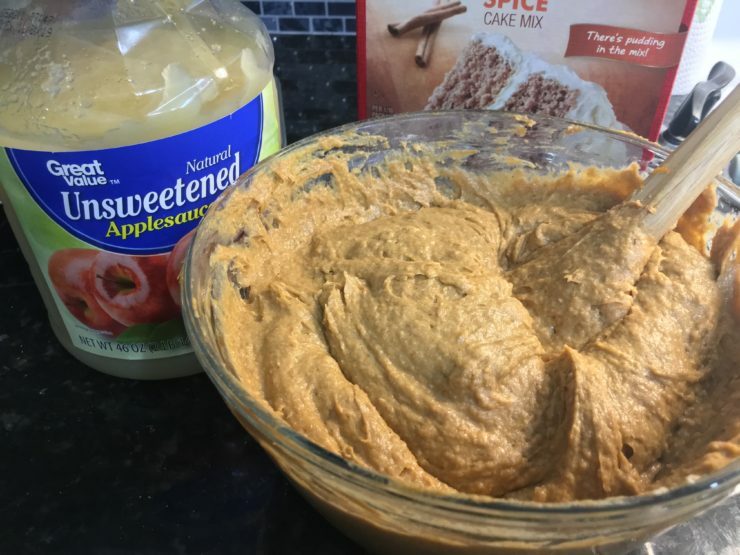 It will seem like you don’t have enough liquid in this batter at first, because the batter will be very thick; but don’t worry because we will be adding some unsweetened applesauce in the next step to fix that. Remember how I said there are no eggs in these Pumpkin Muffins? The unsweetened applesauce acts as the “egg” substitute, giving this pumpkin muffin batter just the extra liquid it needs to be just right. 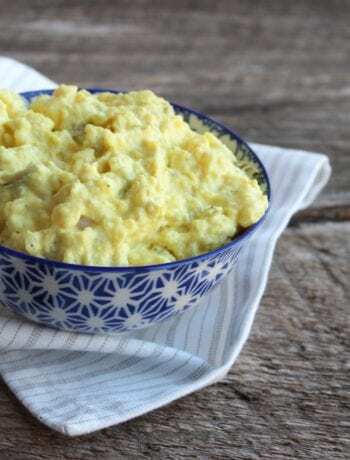 I know you’ve been waiting (and stirring like a crazy ninja) so go ahead and add in that 1/4 cup of unsweetened applesauce to your muffin batter, then stir until it is well combined with the other ingredients. 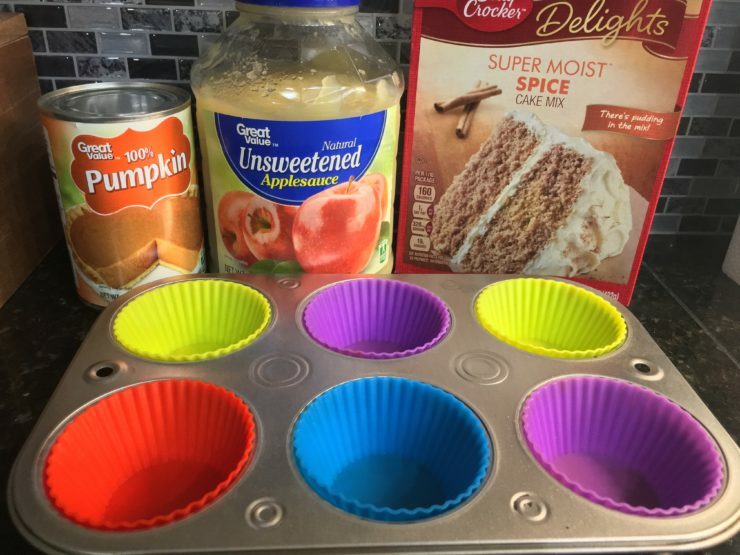 If you want a little extra spice and sweetness, you can always sub in Cinnamon Applesauce for the Unsweetened Applesauce, but I feel that the Spice Cake mix gives these Easy Pumpkin Muffins all they need in the sweetness and spice category. Go ahead and set your oven temperature to 350F and allow it to preheat while you fill your muffin tin with the Pumpkin Muffin batter. 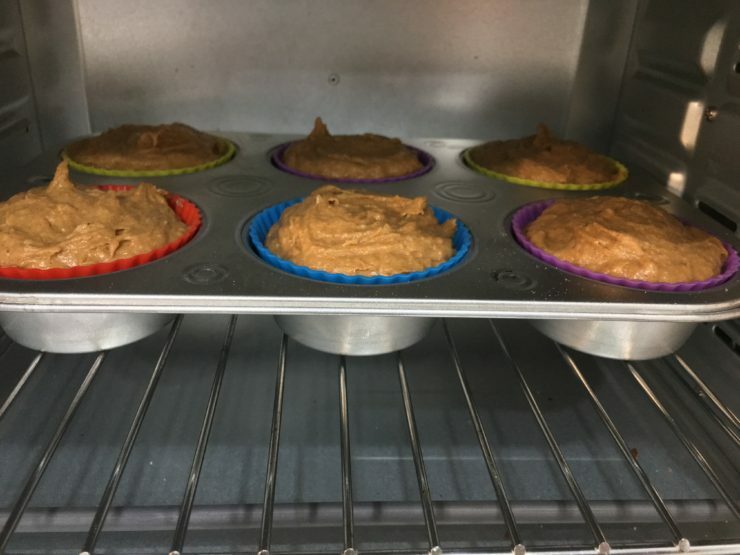 You’ve got your muffin tin lined with silicone muffin liners, you’ve sprayed the muffin liners with nonstick cooking spray, so now all that’s left is to fill those liners up with pumpkin muffin batter! I used a tablespoon to scoop the batter into my muffin liners and I just went ahead and filled the liners to the top. 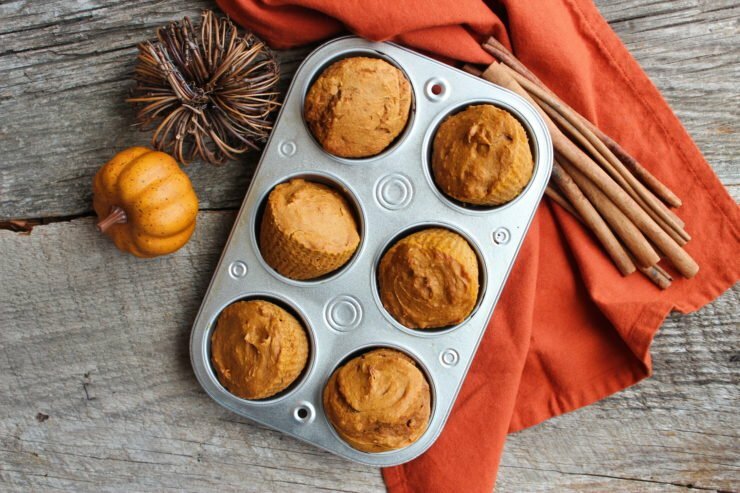 Place your muffin tin into the oven and allow your pumpkin muffins to cook on 350F for 25-30 minutes or until a toothpick inserted in the middle of the muffin comes out clean. If you have a somewhat wonky oven (like I do) you may need to adjust the cooking time down or up slightly or even adjust the temperature to 325F. Once you’ve did the “toothpick check” on your muffins and the toothpick has come out clean with no hint of wet, muffin batter on it, remove your muffins from the oven and then carefully remove the muffins from the muffin pan. I have pretty burn-proof fingertips from all of the cooking I’ve done over the years, so I just played Hot Potato with these muffins and grabbed them out of the muffin pan quickly with my fingers. If your fingers don’t also serve as oven mitts, try using a spoon to leverage the pumpkin muffin out of the muffin tin and gently place it on a baking rack. I know you’re just dying to tear into these Three Ingredient Pumpkin Muffins, but please wait until they are completely cooled before removing them from the silicon muffin liner, otherwise, you may have a crumbly mess on your hands. 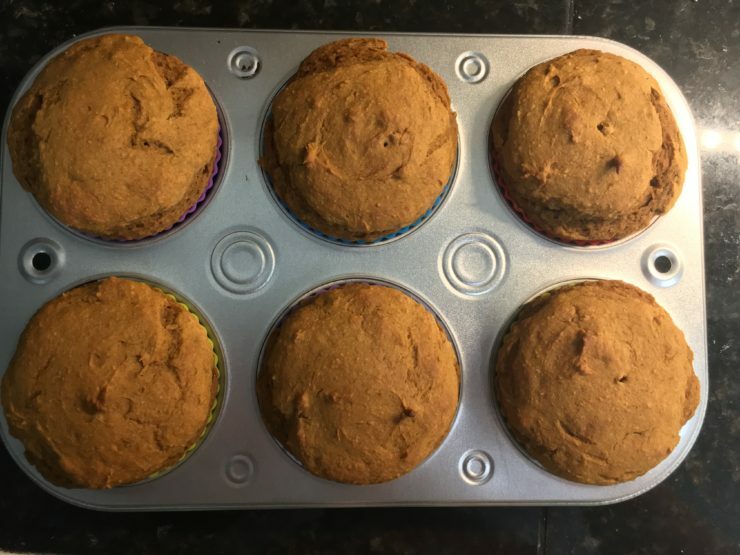 After cooking these muffins, I made the mistake of being over-eager to eat my pumpkin muffin and attempted to remove the muffin liner before the muffin had time to cool – bad idea! Sad to say, I was left holding the top of the muffin while the bottom half stared back up at me sullenly from the muffin liner. Take my advice and just let these little treats cool off first! 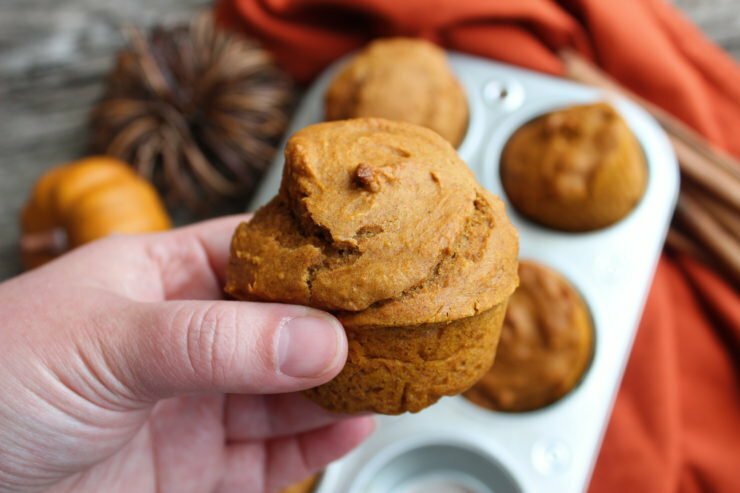 Share these Skinny Pumpkin Muffins with a friend! If you’re looking to brighten someone’s day, add a little pumpkin spice in their life! These Pumpkin Muffins make great little gifts or treats to bring to a party, so have fun with them! For all of my fellow coffee lovers out there (can I hear a holla back, Fam?!) these easy muffins pair amazingly well with a hot latte and would make the perfect breakfast or brunch muffin to serve this fall and winter. These Pumpkin muffins can be stored at room temperature for up to 48 hours but will stay freshest in the fridge for up to 7 days. 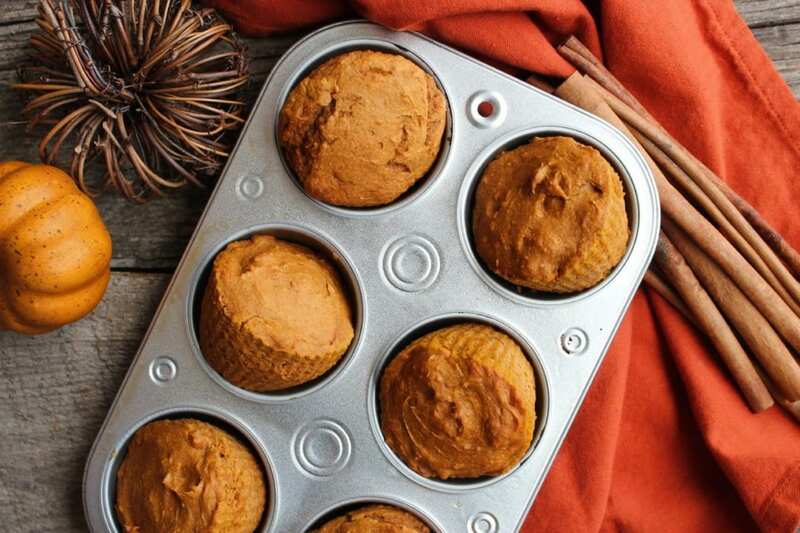 If you have extra pumpkin muffins left over, you can wrap them tightly in plastic wrap or foil and place them in a freezer friendly ziploc bag. These pumpkin muffins can be frozen for up to three months and will taste fresh and delicious when set out at room temperature or in the fridge to thaw. Thank you for joining me today in making these Three Ingredient Pumpkin Muffins and please do come back soon! Three Ingredient Pumpkin Muffins are fast and easy with all of the wonderful flavors of Pumpkin Spice in a muffin. Combine all three ingredients in a large glass bowl and stir until all ingredients are fully combined and no lumps remain. Line a muffin tin with silicone muffin liners and spray the liners with nonstick cooking spray. 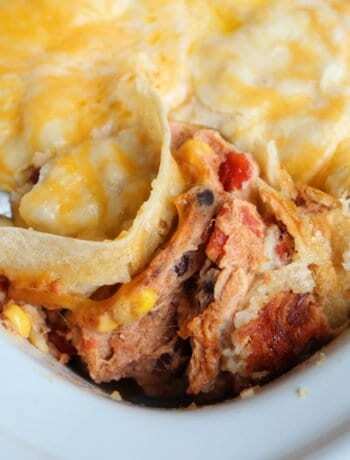 If using a half dozen muffin tin you will need to make two batches since this recipe yield is 12 muffins. 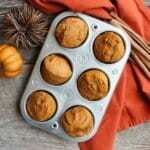 Spoon the pumpkin muffin batter into the silicone muffin liners, filling them just to the top. Bake at 350F for 25-30 minutes or until a toothpick inserted in the middle comes out clean. I love using cake mix as a starter for muffins – these look beautiful! I think cake mix muffins are my favorite because they’re just so simple and easy! You’ve made this look so easy to make – and they look so tempting! Thanks for sharing at the What’s for Dinner party – have a fabulous week! What a great muffin, I will sure be giving these a try! Hope you are having a good week and thanks so much for sharing with us at Full Plate Thursday! We really love this fast and delicious treat! I found these on Meal Plan Monday on Southern Plate. Shared on Pinterest and Facebook. 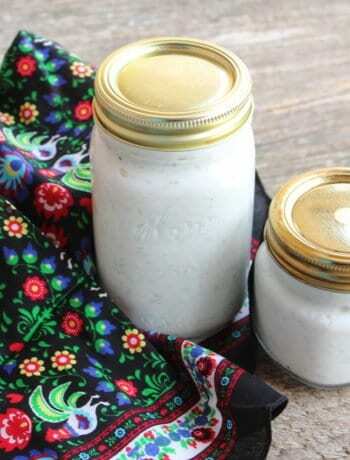 Gonna make some soon.